Those quads are quite lovely, by the way. He lands them so deep in the knee and has excellent flow out of the jump! (Narrator) A remarkable male (figure skater) is a 17-year-old hopeful, Yuzuru Hanyu. (Narrator) Last season he won the bronze medal at the World Championships. He is a young phenomenon. (Yuzuru) I start thinking that I should aim higher and higher. Of course, I must not be satisfied with myself like this. (Caption) The same as above. (Narrator) For his further improvement, he changed his training base to Toronto, Canada. 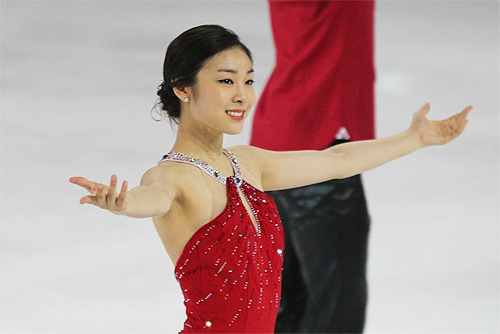 His new coach is Brian Orser, who led Yuna Kim to the gold medal in Vancouver Olympic games. His training time in Canada is nearly twice as long as the training time in Japan. (Narrator) He has received intensive coaching through the coach’s motions. Even off the rink, his training does not end. To develop a broad range of his expressions, he is learning the hip hop dance. He can dance as is shown. (Yuzuru) (His life in Canada is) really fulfilling. I feel as though I just lie down on a bed to sleep immediately when I finish the practice. (Narrator) For the ideal skating that he envisions, he is now into skating. (Yuzuru) I want to be a skater who can do anything. Being able to jump and spin, I want to be someday a skater who is close to perfect in all aspects of skating. Hope you had your day’s dose of Yuzuru and pop culture! So I decided to take a look at Volosozhar & Trankov’s LP test skate that was uploaded recently and didn’t quite know what to expect. Well… maybe I did some crazy Morozov stuff but I didn’t expect to burst out laughing. At the moment, it seems as if the pairs team pegged for Olympic gold are getting angsty and well… really angsty as shown by Max’s bleeding bandage on his head. Unless he was actually injured or something but then he should probably not be skating with a gash on his head like that… However, not only was this program angsty but it was total agony. The music felt really repetitive and two minutes in, I was wondering when it would end. (The ugly lift positions didn’t really help either.) Max and Tatiana need to smooth out a few bumps in their skating – there are quite a few glaring errors here but I don’t doubt their ability to improve throughout the season. That and… wtf… what was that random display of grief at the end. That little angsty bit was admitted the worst but the funniest moment of the entire program which made it worth watching this program to the end. That being said, I don’t think I really want to watch this program ever again. It’s not as bad as Florent’s brain damaging tiger LP but I think I may cry if this is the LP that gives these two the World Championship title. And I guess this is how Russia will reclaim its gold medal in pairs skating next season. With angst and a lot of home cooking. Thoughts? Anything pleasant you want to share? Because I think I’ve been feeling pretty downtrodden whilst writing my most recent posts. Just when I wrote about why I’m excited about this season, I now have a reason to dread this season. Tessa Virtue & Scott Moir, the team who had gotten me back into the world of figure skating fandom is skating to… Carmen.. FOR THEIR FREE DANCE. BLOODY HELL, CARMEN???? SERIOUSLY???? This is a headdesk moment. Many skating viewers have noted that V/M have taken a very “white bread” route and at this point, I really couldn’t agree more. Not only is Carmen an old warhorse, it’s also basically their flamenco/Latin routines redone. I’m really sad to say that I’m starting to lose faith in this couple. They’re supposed to be innovators, creative and on a level that’s beyond all the other skaters. They’re supposed to push and challenge themselves to overcome their weaknesses and they’ve done the complete opposite. You guys are better than the dime for dozen skaters who can take the easy route and skate to a warhorse. I’m disappointed in you two because I know you guys can do better. Wayyy better. This blog post by Morozombie provides an interesting music suggestion. What do you think about this music choice? I believe the junior GP series has already begun and the senior GPs will start next month at Skate America. And I’m about 2 hours away by airplane. So tempted. But too poor. For my fellow readers and friends, some of you may have guessed that I’ve moved. Yet again. I’ll probably be even busier than I was last year but I will do my best to blog or at least follow each competition. My endeavours this year will be more intensive and time-consuming than they were last year but it’ll be one heck of an interesting ride. Let’s hope the figure skating season will be just as interesting. In any case, here are the reasons why I’m excited for the 2012/2013 season. 1. NEW PROGRAMS. Other than Yuzuru Hanyu’s LP, Takahashi & Tran’s “Imagine” SP and “Je Suis Malade” from Weaver & Poje, I wasn’t really fond of the entire slew of programs last year. 2. The progress of some of the up and coming teenagers. I’m especially excited to see the rivalry between Liza and Adelina again as well as Yuzuru Hanyu’s progress under Brian Orser. 3. COMEBACKS. Yuna Kim, Johnny Weir, Windmill guy Evan Lysacek. ‘Nuff said. 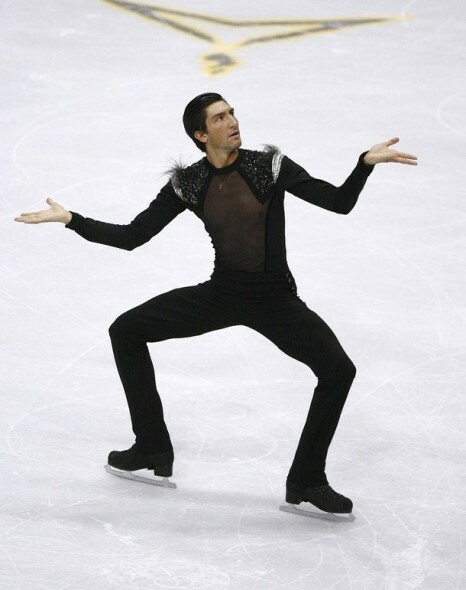 Though I’d rather Lysacek not come back. 4. The result of the Team Canton drama. Will Chock & Bates fly up the rankings and knock the Shibutanis down a peg? I doubt that this new team will be able to beat Meryl & Charlie but defeating the Shibs may be possible if they improve leaps and bounds technically. 5. Seeing how Mother Russia will fare the year before the Olympics. Keep an eye out for Ilinykh & Katsalapov. Rumour has it Elena is Nikolai Morozov’s new girlfriend now that he and Miki Ando are through. The Russian pair of Tatiana Volosozhar & Maxim Trankov should also see some results. 6. The new crazy costumes – I mean, if Johnny is back, we’ll probably see more crazy stuff. And Lysacek might be with Vera Wang and she tends to be very um… creative with Evan’s costumes. 7. The batshit crazy programs by Nikolai Morozov – I suppose it’s a guilty pleasure like that new viral Gangnam Style video. They’re all like train wrecks. You know something bad is going to happen but you can’t tear your eyes away. That and we’ve been so deprived of figure skating for so long that you miss it all. 8. Being able to fine-tune my predictions for Sochi. This is the season to establish a springboard for medal contention at Sochi. There are some skaters who don’t really need this springboard but a lot of the youngins (especially the young Russian divas) need to put everything out there this season so I’ll be expecting a lot. 9. Rivalry drama – V/M vs. D/W, Kim vs. Asada, Liza vs. Adelina, S/S vs. V/T. Need I say more? 10. More proof that ice is slippery and that anything can happen. I am in tears. Life (or my recent part-time job, really) has really taken away a lot of free time and when I decide to check back on the figure skating world, I find this article. In short: Evan Lysacek is coming back and he’s going to be at Skate America. I was actually considering to go to this particular competition since I’m a lot closer to Skate America this year than Skate Canada. I really wanted to see Yuzuru but I’m not sure if I can bear to open my wallet to watch both the beauty that is Yuzuru and the windmill that is Lysacek. There’s always the possibility that Evan will go the Sasha Cohen route and fake (or actually have) an injury and not compete. After all, even at his “peak”, Evan was quadless and had shaky triple axels. Chan, despite his inflated marks, can actually land quads and occasionally skate clean. In the past season, more men have added quads to their repertoire in an attempt to step up their game and dethrone Chan. If Lysacek wants to remain competitive in the men’s field, he’s going to have to pull up that quadruple jump. Nonetheless, we all know that Lysacek has a crazy robot work ethic which might allow him to land the jump, and unfortunately give him the sort of integrity that would drive him to compete at Skate America. Now excuse me while I continue to cry in a corner. Two singles Frenchmen trying to do twizzles. They aren’t that bad, really. Mao still trumps them all though, including Takahiko Kozuka.